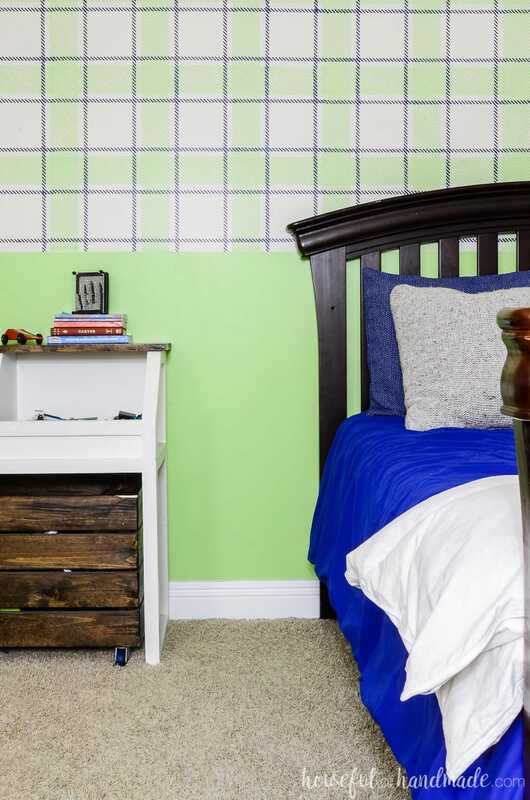 See how we decorated our blue & green boys bedroom with a focal wall and neutral furniture pieces he can grow with. 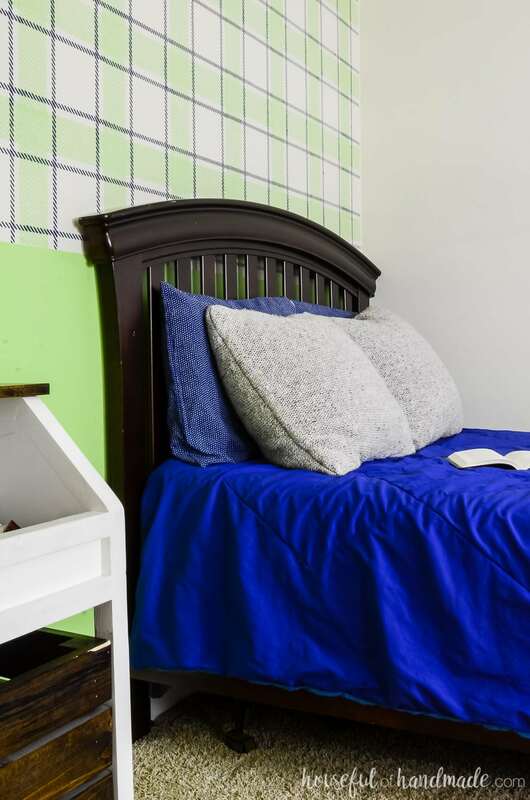 The classic boy’s bedroom color scheme is perfect for a fun room we can enjoy for years. Creating a space for kids to grow up with can be hard. But I knew it was necessary when we moved my son from his cutesy nursery to his big-boy room about 5 years ago. We started with a blank slate: neutral walls, neutral, carpet, and his crib transformed into a full size bed (plenty of room for growing). 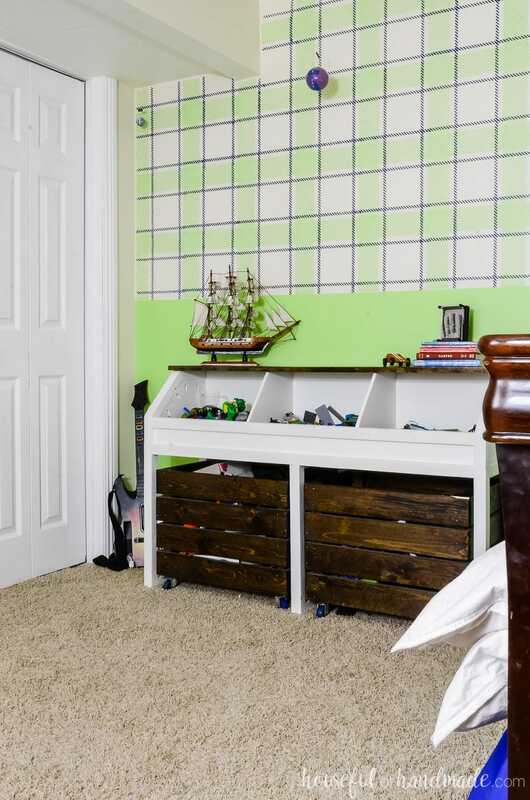 Then we built on from there and created this cool and unique blue & green boys bedroom that he will love for years to come! It’s week 2 of the Room By Room summer decorating series. If you missed week 1, check out our tropical living room summer tour here. 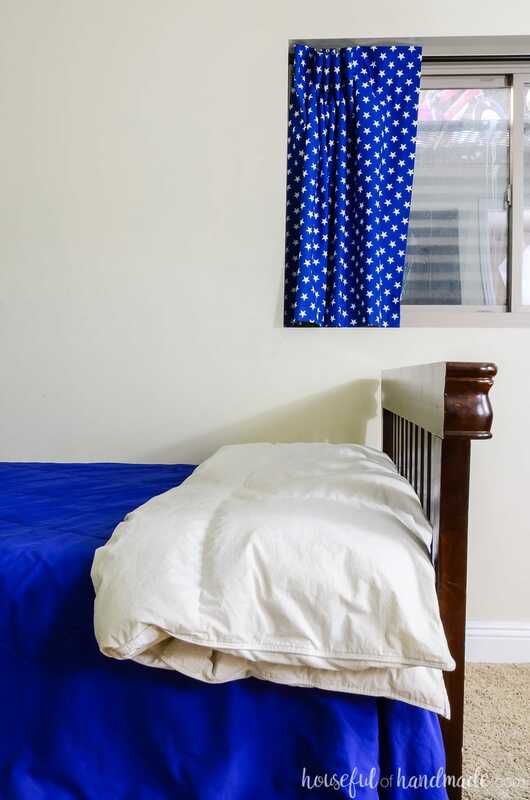 This week we are sharing our summer bedrooms. I shared our master bedroom and some great decorating ideas for a summer bedroom last year. Since not much has changed there, and I realized I have not shared our son’s finished bedroom yet, it seemed like the perfect chance! I love adding a pop of color to any room. A bold statement wall seemed like the perfect way to turn the boring beige room into a cool hangout for my 7 yr old. When designing for kids, it’s always fun to let them help pick the paint color scheme for their bedroom. If they pick crazy colors, use neutrals to balance it out. Focus the room on colors that you know will work and add the rest of their favorite colors into the room as accents. It was no surprise that my son choose blue and green room decor for his space. 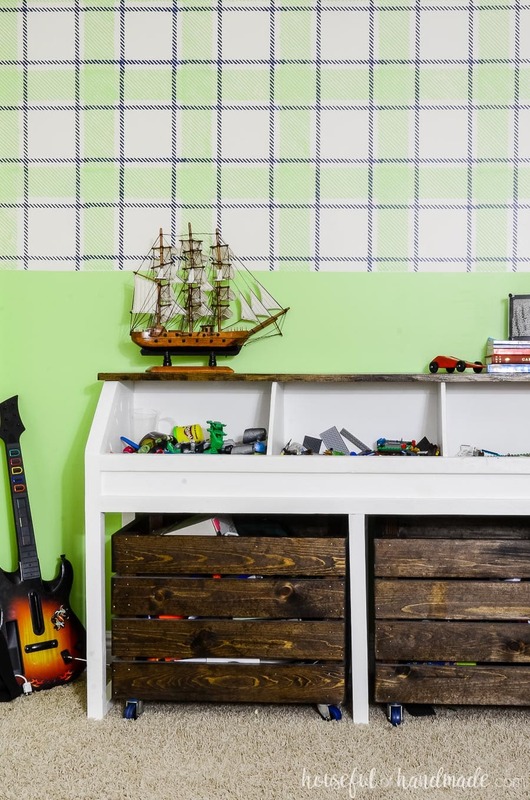 To keep things fun, but cool enough for a pre-teen or even teenage boy, I decided to add a plaid wall for our statement piece. The green & blue colour scheme worked perfect with a classic plaid design. I made a DIY wall stencil and set to work. I’m not going to lie, stenciling this wall with multiple colors did take a bit of time, but it was worth it. Download a new audio book on Audible (affiliate link) and have some fun. 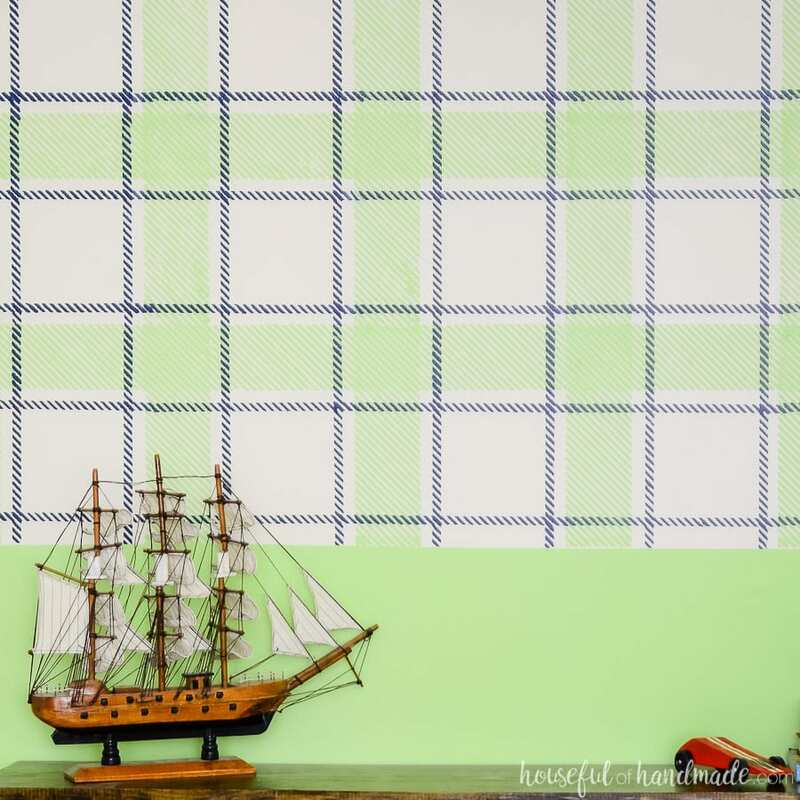 I share all the stenciling tips, tricks, and even the free stencil design for the DIY plaid wall here. 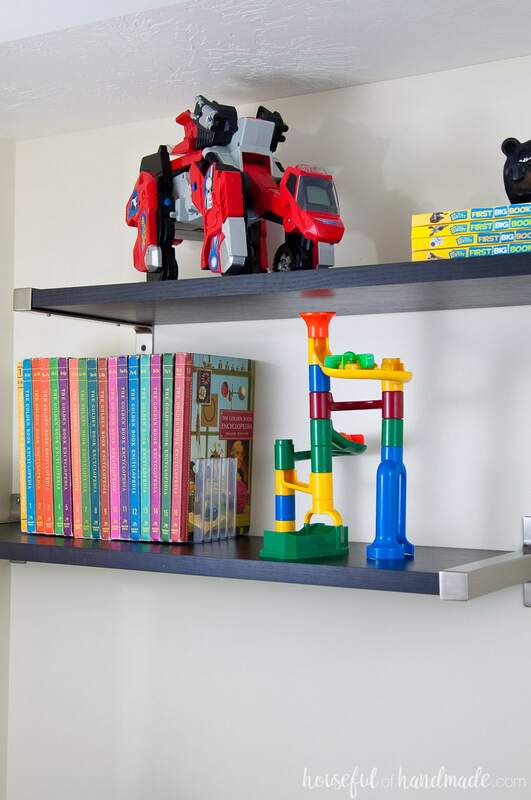 One of the biggest challenges in decorating a kids room is toy storage! If you have boys you probably have Legos. Those tiny little bricks that every parent has a love/hate relationship with. We needed a solution for the Legos, action figures, and all the rest of his toys. But again, I wanted something that he would grow into. What came from that was one of my favorite builds ever: this rustic toy storage unit. The toy storage unit was the perfect solution for a console to hold some decor items as well as all those toys. And as he grows, those bins can be used to hold whatever he needs. This piece is perfect for a kids bedroom or even for a playroom space. There is so much storage in here, my son almost always keeps his room clean. Another great decorating solution for growing boy was this rustic industrial wall mounted desk. The desk is the perfect place for our son to do homework, assemble his robots, and anything else he can dream up. But my favorite part, is the desk is mounted to the wall so there are no legs on the floor. It is easier for him to clean around it and nothing gets lost underneath. Above the desk I installed some floating shelves to hold books and toys. The dark wood of the shelves and exposed end caps are perfect with the rustic industrial look that keeps things more masculine for a growing boy. Even when they are decorated with toys! 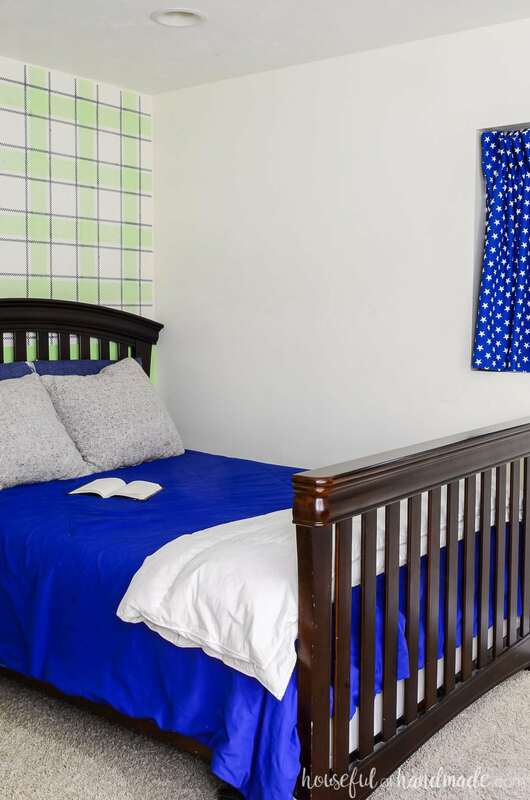 And to keep the blue and green boys bedroom color scheme going, we added a blue comforter to the bed. A couple comfortable knit pillows add extra coziness for when he wants to curl up in bed with a book. And of course, an extra blanket is always needed for a cool night or afternoon of fort making! One last thing to note about decorating a children’s room is the curtains. I love curtains over blinds because they are less likely to get destroyed when kids want them open to look outside or closed because they are playing a game. But floor length curtains can also be a pain because they get pulled on with dirty fingers and also become a stashing place for hiding toys they were suppose to be cleaning up. Instead I opted for short curtains that fit inside the window frame. Also, we picked black-out curtains so we can make the room dark for nap time or when the summer evenings are too bright for the kids to fall asleep. And that is the complete tour of our son’s blue & green boys bedroom. We love the space (even more when it’s clean). It’s got all the things he needs as he grows up into a little man! And don’t forget to check out the rest of the Summer Bedroom Tours, then come back next Thursday for Summer Kitchen tours. I am trying really hard to have our kitchen remodel 110% done for it! Wow! I can’t believe that plaid wall is a stencil! Great job. I also really love the floating desk and toy storage. Everything he’ll need as he gets older. Thanks Amy! I know he will be able to grow in this room so nice. What a great boys room. The plaid accent wall is perfect. I can’t believe how well you stenciled it. WOW! The toy chest is a great addition that will grow very well with him. My favorite is the wall mounted desk. Great job! Thanks so much! The wall was a little time consuming, but totally worth it! Hey Kati – what a great room! First…your son has great taste in color combos. Second…his mom is a rockstar at creating a fantastic room. 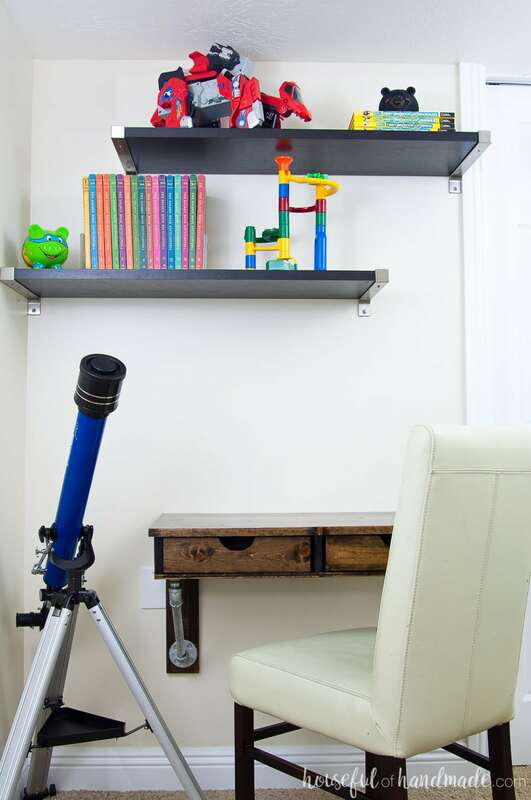 Love the DIY toy chest – BUT the hanging wall desk is genius! Great job! Thanks! He did pick great colors 😉 I love that desk too, hopefully he will get lots of use from it!